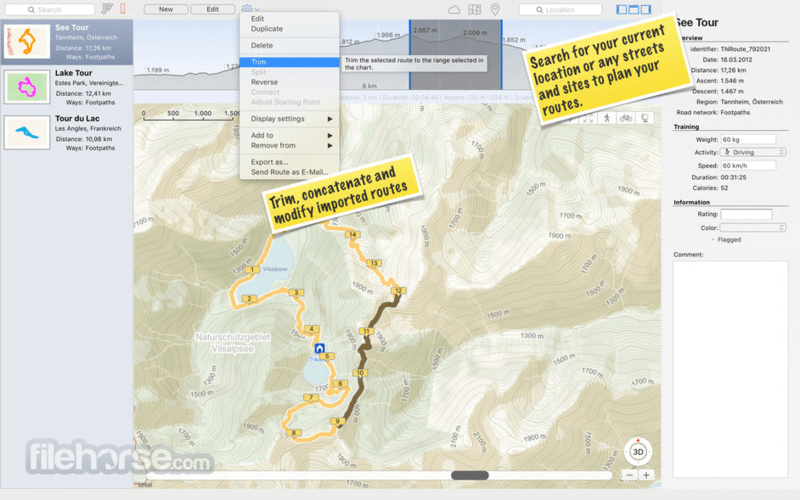 TrailRunner for Mac is a route planning software for all kinds of long distance sports like running, biking, hiking, inline-skating, skiing and more. If you ever asked yourself how long your workout routes are and what route you should choose for this evening — then TrailRunner should be your training-partner. TrailRunner can calculate a route for your desired distance and export directions onto your iPhone or GPS, giving you a detailed orientation while you are on your way. For Running. Plan workout routes and check your pace at checkpoints. For Biking. Import and analyze GPS recordings. Including recoded data like hear-trate, power and cadence. For Hiking. Plan tours and collect beautiful tracks and trails. Activities. Import your activities into different diaries. Route Planning. Create new routes interactively or automatically, for a given distance and with the highest attractiveness. Personal Network of tracks. Manage your local network of favourite tracks. Annotate your tracks with descriptions, colors and the famous iTunes rating stars. Internet Services. Load background maps and elevation data from openStreetMap and other services. iPhone. 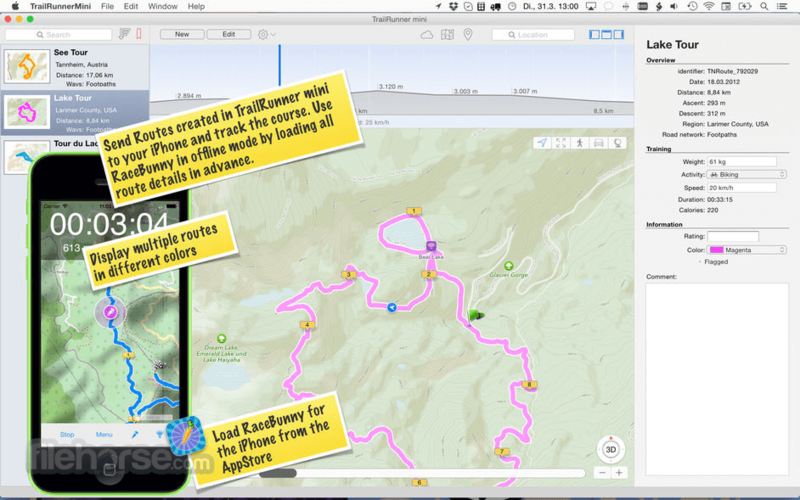 Import GPS route courses from the iPhone. Share Routes. Share your routes on GPSies.com and EveryTrail.com with members of the biggest online outdoor communities. Nike + iPod Sport Kit. Import workouts from your Nike+ Sportband or iPod Sport Kit and assign routes with real world distances. Heart Rate Monitors. Import and manage GPX or Polar HRM workout protocols. NanoMaps. Export route descriptions as NanoMaps for iPods or cellphones. Diary. Collect and describe workouts in different diaries. Compare histograms per workout and over time. Apple Mobile Me. Publish an excerpt of your diary and route descriptions as a WebLog. Exercise plan & Calendar. Improve your base endurance in small and adaptive steps by following your workout schedule. Manage your goals and planned events. Languages. Available in English, German, French, Italian, Spanish, Dutch, Swedish, Japanese, and traditional Chinese. GoogleEarth. Watch routes in GoogleEarth with just one click.